Cádiz is a port city in southwestern Spain. It is the capital of the Cádiz province, one of eight which make up the autonomous community of Andalusia. http://en.wikipedia.org/wiki/C%C3%A1diz. Figure 2 A view of from Cadiz. The city of CADİZ (Gades, Qadis) in Iberian Penninsula was founded by Phoenicians as a base for their overseas “sea based” commercial operations. The names CADİZ, GADES, QADIS are the variations of the Turkish word KUT-ÜS (KUDÜS) meaning “Holy place” or “Holy base”. In Turkish the word “ÜS” means “a military base” or a “base for other operations,” and the term “KUT” (QUT) means “holy”. Similarly, the names Cadiz, Gades, Qadis are very much like the Arabic name “AL QUDS” meaning the “Holy City”. AL QUDS (i.e., Jerusalem) is an ancient so-called “PAGAN” city that was built in the time of CANAANITES, that is, the “PHOENICIANS”. But the so-called CANAANITES (PHOENICIANS) were “GÜNHANS” who were Turkish speaking Turanian peoples - contrary to known knowledge which identifies them wrongly as “Semite” people. The name CANAAN is a Semitized and Anglicized form of the name GÜNHAN. They were also known by the Aryanized name TYRIANS, supposedly after their city named TYRE which is the Turkish saying “TUR EVİ” meaning “house of Tur”, that is, “the home of Tur/Turk/Oguz peoples!” The Aryanized word “TYRIANS” is an altered form of the Turkish word “TURANCI” that means “people from Turan” or “Turanian people”. This also identifies the Phoenicians as a Turanian Tur/Turk/Oguz people. Similarly, we find embedded in the name PHOENİCİANS the expression “CONHAN-PEIIS”, which is, in Turkish, “GÜNHAN BEYİZ” meaning “We are Sun lords”. This finding is not a coincidence. With all this, we find that the original ethnic identity of the ancient people called Phoenicians were actually Turanian GÜNHAN LORDS contrary to the claim that they were Semitic peoples. Evidently, during the times of the Canaanites, the Semites and Aryans were confusing and obliterating the “one language that the world spoke” at that time. By use of such linguistic trickery, not only was the language of the GÜNHANS stolen, but also their Turanian Turkish identity was obliterated. Unfortunately, regarding their ancient true Turanian identity, we have no more than historically altered and fraudelent disinformation that have been told and repeated to the world by Aryan and Semite writers. 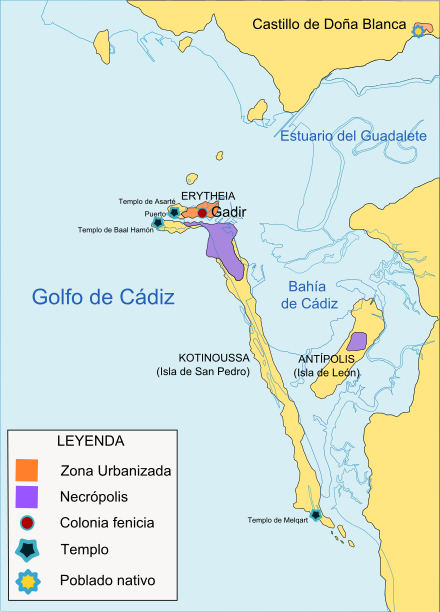 So, the Spanish city of CADIZ (a Romanized name) is another form of the Turkish name “KUT-ÜS” meaning “Holy Base”. Cadiz is one such ancient town in present Spain! But all of these identifications regarding the city of Cadiz relates this ancient city to the ancient Turanian Tur/Turk/Oguz peoples - contrary to historical lies and distortions claiming that it was a “Semitic” city. Presently, the Spanish autonym for residents of Cadiz is called gaditano, that is, they are the natural born citizens of Cadiz, Andalucia. This name has a number of Turkish expressions embedded in it which are relevant to the ancient identity of the gaditano people. For example, this we see when the name GADITANO is deciphered as “GON-ATADI”, its linguistic source is found to be an altered form of the Turkish saying “GÜN ATADI” meaning “it is Sun Father (people)”. This is another form of their original Turkish name of GÜNHAN (GÜN-HANU, GÜN-ANU) meaning “Sun God”. Additionally, when the name GADITANO is deciphered as “GON-ADATI”, its linguistic source is found to be an altered form of the Turkish saying “GÜN ADADI” meaning “it is Sun Island”. This definition in Turkish describes the island on which the city is built as a SUN ISLAND. This expression in Turkish again refers to their original Turkish name of GÜNHAN (GÜN-HANU, GÜN-ANU) meaning “Sun God” people. The island and its environment is also known as ERYTHEA or the ERYTHEIA THE RED ISLE OF SUNSET, (see Figure 3 below). Additionally, when the name GADITANO is deciphered as “ADI-GONTA”, it reveals its linguistic source as the Turkish saying “ADI GÜNTİ” meaning “its name is Sun”. These identifications again verify that the original name of the Phoenicians was the Turkish name GÜNHAN indicating that they were ancient Turanian Tur/Turk/Oguz peoples. Thus, it can be said that the present CADİZ residents are related to the ancient Turkish people of Günhans irrespective of the fact that they have been Aryanized and Christianized. The ancient Phoenician city of City of CADIZ is also known as GADEIRA. GADEIRA is the altered form of Turkish saying AGADİR meaning “it is the Lord”. It is located in the ANDALUCIA province of Spain. The name ANDALUCIA itself is also very revealing. When the Romanized name ANDALUCIA is deciphered as “ANADULICA”, it reveals its linguistic source as the altered form of the Turkish saying ANADOLUCU meaning “from Anatolia” indicating that the original people had come here from Anatolia and that they were Turkish speaking before they were Aryanized and Christianized. This also indicates that “they spoke the native Anatolian language which was Turkish”. The name ANDALUCIA is also similar to the name LUCITANIA which is also made up from the Turkish saying ANADOLUCU meaning “from Anatolia”. So both of these names verify each other. a) KUT ÜS (KUD ÜS) meaning “Holy place”. b) KUT SU (KUD SU) meaning “Holy water”. c) KUT IŞU (KUD IŞU) meaning “Holy Light”. d) KUT US (KUD US) meaning “Holy wisdom, holy knowledge”. e) KUT ISI (KUD ISI) meaning “Holy heat (fire)”. f) KUT OS (KUD OĞUZ) meaning “Holy Oğuz”. Shown in Figure 3 above are two islands on which ancient Phoenicians founded their city of GADIR. The islands are named as ERYTHEIA and KOTINOUSSA (Isla de San Pedro), that is, the “Island of Holy Father”. We have the following information from the book entitled “The Phoenicians and the West: Politics, Colonies and Trade” by Maria Eugenia Aubet, [p. 264]. Figure 4. This citing is from the book by Maria Eugenia Aubet. Polat Kaya: The island named ERYTHEIA was the Phoenician Tyrian colony. The name ERYTHEIA is related to the Phoenician name TYRIAN. The name ERYTHEIA deciphered as “TYR-EHE-IA”, reveals its source as the Turkish saying “TUR AHA ÖYİ” (TUR AĞA ÖYÜ) meaning “Home of Tur Lords”. Similarly, the name TYRIAN, deciphered as “TYRNIA”, is the altered form of the Turkish saying “TURANIA” meaning “Home of Turs” and also “Home of Turanians”. Thus, both names ERYTHEIA and TYRIAN refer to ancient TURAN peoples, that is, the Tur/Turk/Oguz peoples indicating that the founders and owners of the ancient city of GADIR (GADEIRA) were Tur/Turk/Oguz peoples. In the same context, the island named KOTINOUSSA, the long and larger island where the temple of Melqart was located, is also an altered and restructured Turkish saying. This we see when we decipher this name as follows: The name KOTINOUSSA deciphered as “KUT-OOSSNIA”, reveals its source as the Turkish saying “KUT OĞUZ’IN EVİ” meaning “The House of Holy Oguz”. This definition in Turkish is very much the same as the meaning attributed to the island of KOTINOUSSA (Isla de San Pedro), that is, the “Island of Saint Peter” or “the Island of Holy Father”. The Turkish name OGUZ, like the name of TUR, is one of the ancestral names of the Tur/Turk/Oguz peoples. Additionally, the name OGUZ was one name of the ancient Turanian sky deities, that is, the Sky-God, Sun-God and Moon-God. Thus, he was the creator father God of ancient Turanians, and this Romanized name KOTINOUSSA indicates that the island was originally named after the Turanian Father God OGUZ. Additionally, the name KOTINOUSSA, deciphered as “KONOS-ATUSI”, reveals its source as the Turkish saying “GÜNEŞ ADASI” meaning “the sun island”. This is amazingly relavent to the Turkish identity of the Phoenicians and verifying the fact that the true name of Phoenicians was GÜNHANS (Sun Lords) contrary to the fact that they have been presented to the world as Phoenicıans and Canaanites. These explanations and revelations of mine in Turkish finally uncover the deceptive and evil whitewashing (coverup) of the Turanian Turkish identity of the Phoenicians / Canaanites, that is, the GÜNHANs. In other words, the Phoenicians were not Semitic people. The Phoenicians were TUR/TURK/OGUZ peoples whose identity was intentionally hidden and obliterated. In other other words, the Semites - by misrepresenting these ancient Turanians with Greek or Semitic names, not only denied the Turanian Turkish identity of the GÜNHANs to the world, but they also transferred the noble and upright Turanian ‘character’ of the GÜNHANs unto themselves – thereby elevating themselves when they were simply believers of darkness and the wind. Furtheremore, the name KOTINOUSSA, deciphered as “AKUSSINTO-O”, also reveals the Turkish saying “AĞUZUNDU” meaning “it is your mouth”. To the ancient Turanians, the “human head and mouth” was holy and was a god. That is why the Turkish words OĞUZ and AĞIZ are very related words that describe the ancient Turanıan sky deities and the human mouth and language. Human head and mouth, in addition to eat and drink, thinks, learns, creates, writes and reads, makes and builds, speaks, sings, and does countless other things that man is capable of doing. Everything done by man is under the command and control of his head and mouth. Curiously, the name CADIZ and GADES, when rearranged as “ACIZD” and “AGESD” respectively, shows that they are altered form of the Turkish word “AĞIZDI” meaning “it is the mouth; it is the language”. This is most enlightening. When we inspect the Gulf of CADIZ (GADES) above in Figure 3, we note that the natural geographical structure of the Gulf of Cadiz is like a human mouth, in its natural make up. Thus, the altered names of these two Phoenician islands in the Gulf of Cadiz, despite the fact that they have been altered and Aryanized, were originally named after the names the ancient Turanian sky deities TYR (TUR) and OGUZ. This also verifies that the Phoenicians were Turkish speaking Turanian Tur/Turk/Oguz peoples, named specifically GÜNHAN Lords. Furthermore, their holy names, plus the fact that there were temples built for the Phoenician gods and goddesses on these islands, made the Phoenician city Gades/Gadis/Cadiz, a “Holy City” - like the City of AL-KUDS (i.e., the so-called City of Jerusalem) back in the Canaan land. Figure 5 View of the famous yellow cupola of Cadiz Cathedral, in Andalucia. A temple with representations of the two “Pillars of Melqart” in Cadiz. Polat Kaya: The two towers are the representation of the so-called “Pillars of Hercules” or alternatively “Pillars of Melqart”. Very little remains of the Phoenician language, but numismatic inscriptions record that they knew the site as a Gadir or Agadir (ऀंःओ), meaning "The Wall", "The Compound", or (by metonymy) "The Stronghold". Borrowed by the Berber languages, this became the agadir (Tamazight: "wall"; Shilha: "fortified granary") common in North African place names. (The Israeli town Gedera shares a similar etymology.) The Carthaginians continued to use this name and all subsequent names have derived from it. Attic Greek sources hellenized Gadir as tà Gádeira (Ancient Greek: τὰ Γάδειρα). Herodotus, using Ionic Greek, transcribed it a little differently, as Gḗdeira (Γήδειρα). Rarely, as in Stephanus of Byzantium's notes on the writings of Eratosthenes, the name is given as è Gadeíra (ἡ Γαδείρα). Polat Kaya: First of all, the saying that the Phoenician name GADIR or AGADIR means "The Wall", "The Compound", or (by metonymy) "The Stronghold" is wrong and is plain disinformation. Metonymy is a figure of speech in which a thing or concept is called, not by its own name, but rather, by the name of something associated in meaning with that thing or concept. In other words, these metonymy names and their meanings are really designed to cover up the true identity of this ancient city and therefore are not representing the truth. In Turkish, the word KADİR means “mighty, powerful, very strong” and also “Almighty (God), All-Powerful (God).” (Redhouse Turkish-English Dictionary, 1987, p. 577). And the name KADIR (GADIR) is also a name for men in Turkish. Thus, the Phoenicians surely would have named their city after their Sky-God - and also about their own lordly identity - rather than calling the city by a name that means “wall”. The term GADİR is a word that indicates the mightiness of the Phoenicians and their God. After all they were the GÜNHANS, that is, a Turkish name that was taken after the Sun God which is the most creative, illuminating, enlightening, warming fire power in the sky near the earth. Therefore, the Turkish names GADIR (KADİR) or AGADIR (AĞADIR), would be a much more befitting name for this ancient Phoenician city. Also, the saying that Attic Greek sources Hellenized Gadir as tà Gádeira (Ancient Greek: τὰ Γάδειρα) is fully expected because the ancient Greeks took all of their information from the ancient Turanians and Hellenized them. Even the ancient Greek language was fabricated by altering and restructuring ancient Turanian words and phrases. The Greek name TÀ GÁDEIRA, deciphered as “ATA GADIR-E”, reveals its source as “ATA KADİR Evi” meaning “Home of Father GADİR”. This definition refers to Cadiz as being a home of the Almighty God; and hence, it refers to the city as a holy place in view of the ancient understanding. The Greek term GADEIRAS (gr: Γάδειρας) is given as the Greek name of the archipelago of islands existing in what is now the Bay of Cádiz. In this context, when the name GADEIRAS is rearranged as “GADIS-ERA”, it is found to be an altered form of the Turkish expression “KUDÜS YERİ” (KUTSAL YER) meaning “holy place”. Turkish word KUTÜS (KUDÜS) means “Holy place” or “Holy base”, “ÜS” means “a military base” or a “base for other operations,” and “KUT” (QUT) means “holy”. Similarly, when the name GADEIRAS is rearranged as “AGA-ESDIR”, it is found to be an altered form of the Turkish expression “AGA ÜSDİR ” meaning “it is great operation place” which it was. 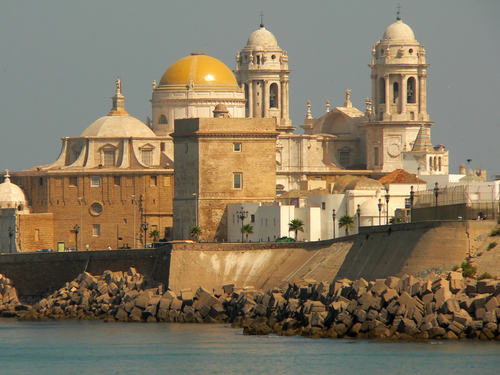 The old city of Cadiz is also called “Costa del sol” (Andalusia). The name “Costa del Sol” means literally, "Coast of the Sun"). The name is again associated with the SUN, that is, Turkish name “GÜN”.